The good news for the newspaper industry in this data is that the percentage of digital ad revenue is growing at a double-digit pace. 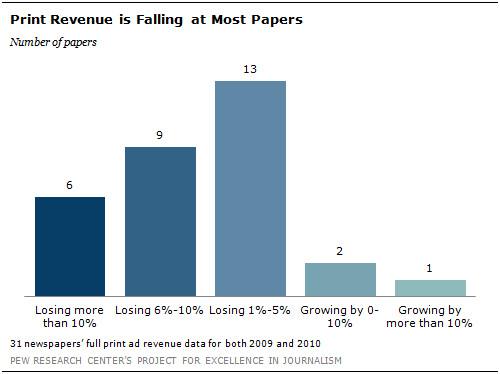 Overall, for the last full year for which papers had data, digital revenue at the papers studied grew 19% on average. The bad news is that print ad sales, which still account for 92% of the overall ad revenue of the papers that provided data, fell by an average of 9%. Thus the actual dollar gains were outnumbered by losses by a factor of 7-to-1 for those papers. These tallies of overall print and digital ad revenues included the last year from which the papers had complete data (2010). We found that the highest rate of annual digital ad revenue growth occurred at those papers with circulations of 50,000 and above. At those papers, digital revenue grew 20% on average. The smaller papers (those with circulations of less than 25,000 and those between 25,000 and 50,000) had very similar rates of digital ad growth-14% and 13% respectively. The good news at small papers is that they appear to be losing print revenue at a slower rate. In the data provided to PEJ, papers with circulations under 25,000 suffered declines in print advertising of about 3%, about one-third the rate of the overall sample and for papers with circulations of 50,000 and above as well. In the follow-up interviews with executives at 13 companies, the trends in print and digital ad dollars remained largely the same from 2010 to 2011. That was particularly true when it came to continuing losses in print. The executives pegged their current annual decline in company print revenues at between 4% and 13%. On the digital side, nine of the 13 companies indicated that the 19% gain in digital revenue accurately approximated what was happening in their companies. Two of the companies said they had achieved growth in digital revenue in 2011 of 60%. One executive said the growth in digital revenue at his company’s newspapers was in low single digits. In other words, these companies are seeing growth in digital ad revenues overall even though some of their individual papers are not. Industry wide, according to data from the Newspaper Association of America, digital revenue grew 11% in 2010 and 8.3% in 2011. Thus the papers studied here in aggregate fared better on the digital side than the industry overall. The declines in print advertising at the papers in our sample closely reflect industry aggregate figures. The digital ad revenue increase of 19% and the print ad revenue decrease of 9% is calculated by adding up the total amount of ad dollars and dividing by the number of participating newspapers, which is the way most newspaper companies report their results. Another way to gauge newspaper economics, which may reflect more fully the most typical results, and ease the effect that large papers may have on the totals, is to calculate the average gain or loss in print and digital for each individual paper and average them together. By that method, the average digital ad revenue gain per paper was 12% in the last full year while the average print loss was 5%. One of the advantages of this study, because it is derived in part from data provided by specific newspapers, is that we can answer one of the questions that has eluded many analysts: whether any papers or companies have found what might amount to a path forward. In other words, do these aggregate numbers reveal an industry that is moving in lockstep? Or are there variations that suggest different approaches, different cultures and different management can make a difference? The newspaper level data suggests that there are significant variances. 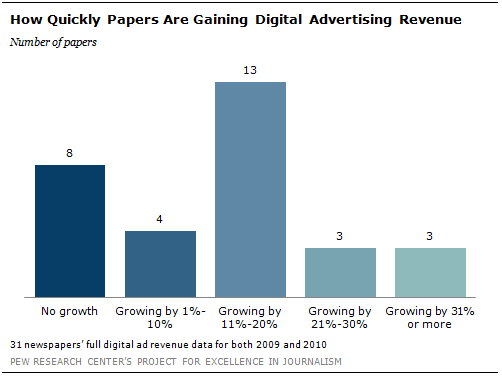 At one paper, the gains in digital revenue completely offset the losses in print ad revenue. The paper posted a 13% increase in digital revenue. But the key to its success was keeping print ad revenue losses to less than 1%. Two other papers managed to grow both print and digital ad revenue. One of those was the paper with the highest rate of digital ad revenue growth, 63% in the last full year for which data were provided-more than three times better than the overall sample. That paper also had gains in print advertising revenue of 8%. The outlet with the 63% digital revenue gain is a small circulation paper (about 20,000) in a small city. Its digital revenue also comes largely from very traditional digital categories, display and classified digital revenue. This paper has not yet generated substantial amounts of money from such platforms as targeted digital advertising and video. The paper also is collecting very modest revenue from mobile. In addition, this paper does not derive a large amount of its overall revenue from digital yet. In all, digital accounted for 5% of the paper’s revenue in 2010. What its performance suggests, rather, is that a paper that has lagged in building digital can make up progress very quickly. In a follow-up interview with executives at that paper, they indicated the positive trend lines had continued, with digital ad revenue jumping by about another 33% in 2011. Some of the good news stemmed from local circumstances, such as a big boost in employment ads-both in print and digital-thanks to a hiring spike in the community’s major industry. But even though this is a small paper, the publisher said executives there have been thinking about the digital transition for some time. "We knew that digital was something we had to tap into," he said. To do that, the paper aggressively sought to hire digital sellers onto its small sales staff. It also spent significant time training sales staffers and now, "All of our staff sell digital. Almost everything we sell has a digital component." The publisher also indicated the paper had received strong support in its efforts from the parent company. In addition, the publisher said in February 2010 the paper began acting as a digital consultant for small businesses and is now developing a modest but promising revenue stream there. Another successful outlier newspaper in our study reported a 50% digital ad revenue gain. This newspaper was one of the largest studied. It has a circulation of more than 100,000 and is located in a large metropolitan area. It also is continuing to see print ad revenue decline-by 7% in 2011. This paper also has made more progress than most shifting to digital, though it is still largely a print-based company. In all, digital ad revenues amounted to almost one-fifth (18%) of the print advertising revenues. Those digital revenues also came from a more diversified digital ad base than was typical of the papers studied. On the digital side, display and classified accounted for less than 50% of the total. At this paper, video and "smart" or targeted advertising already account for about 20% of the digital ad revenue pie. One of the guiding principles for this news organization was a strong mindset that the Web, both editorially and in revenue, should be the first priority. It has invested heavily in creating digital agency services as a form of nontraditional revenue and also has focused heavily on retooling its sales staff. Four other papers in the sample had grown digital revenue by more than 25%. One small paper (circulation less than 10,000), that generated about 90% of its digital revenue from display and classified reported a 37% increase in the last full year. Three others achieved increases between 25%-30%, two with modest-sized circulations (around 25,000 and 19,000) and a larger urban outlet with a circulation of nearly 80,000. Just as we see examples of papers that are succeeding more than others, there are conversely several newspapers in our sample that were faring worse than the average, even seeing digital ad revenues fall. One paper suffered a decrease in digital revenue of 37%. At another, digital revenue fell 25% for the last full year for which they had data. These two papers also had a number of things in common. They were both small, with circulations less than 15,000. They also both were deriving more of their digital revenue from the two most basic categories of advertising. The paper with the 37% loss generated nearly 100% of its digital revenue from display advertising. The other paper generated a large majority of its digital ad revenue from classified and digital combined. And neither of them had collected any revenue from nontraditional sources. With newspapers at an early stage in the development of new digital revenue streams, there is little expectation among many of the newspaper executives interviewed that the gap between growing digital dollars and diminished print dollars can be erased in the near future. One executive said the formula for achieving the "crossover point" at which digital gains would offset print losses-was reducing the annual print losses to somewhere between 6% and 8% and growing the digital revenue at a minimum of 30% annually. Another said he thought the rate of digital growth would need to be close to 50%. A number of executives agreed that any path to a successful business model must include slowing the rate of decline in print advertising. "There was not an expectation that print would fall so fast nor would print be falling significantly when the economy is not," one executive explained. But some executives believe there is some conflict between trying to limit print losses and grow digital. One executive emphasized that he didn’t think dramatic digital growth would occur anytime soon because newspaper companies are sacrificing some digital dollars as they try hard to bump up those print ad revenues as much as they can. And there is a clear sense of uncertainty among executives. One, who described his company as being just 5% to 10% down the road toward a revamped business model, said, "I think as a company we are just getting to a point where we are starting to make decisions about how we are going to move in this new direction. One of the difficult things at least in my mind is sorting out how much of our current economic issues is purely the bad economy and how much is changes in the structure of our business and how our advertisers and readers interact with us." Yet another said flatly, "The newspaper industry cannot sustain its existing cost structure now. It’s a fact of life. It is going to have to get leaner than what it is." Then he described what he imagined as the news product of the future at newspapers: "You can think of it in terms of probably one-third original content, one-third blogger opinions and one-third community journalism [generated from] outside." Industry wide print ad revenue averages 85% of all revenue.